As drone racing becomes a serious sport, it has also gotten cheaper. At just a couple hundred bucks or so, the Eachine Wizard X220 is an impressively fast and nimble racing drone. 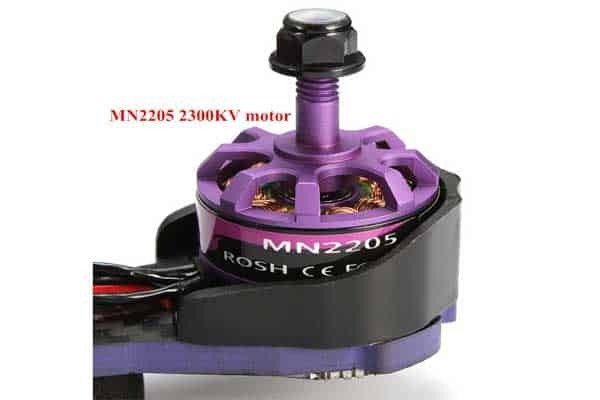 The new MN2205 2300KV motors deliver more power to the props, providing you with speed and thrust when you need it. The three-blade propellers provide strong lift even in rough weather conditions, allowing you to get ahead in no time while the ultralight carbon fiber frame ensures you are not slowed down by any unnecessary weight. 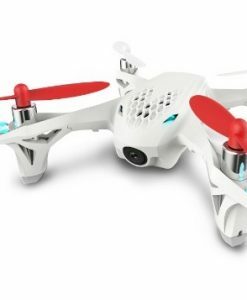 The design is not as hardy as in other pricier racing drones, so you should expect to replace several components now and then, especially the propellers. But the essential parts such as the camera and video transmitter are well protected. Thus you don’t have to worry about expensive replacements. There are two versions of this racing drone: the Eachine wizard x220 ARF and the Eachine wizard x220 RTF. 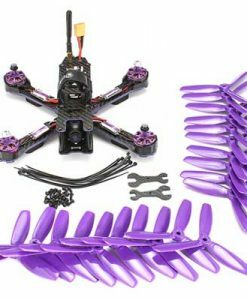 The ARF (Almost ready to fly) version is perfect for those who want a clean build with custom components and a revved up performance. But if you’d rather start flying immediately, the RTF (ready to fly) version is yours. Eachine has been at this game for quite some time, constantly trying to improve their racing drones through better design, a lighter but stronger frame, and increased flexibility. As most drone racing enthusiasts would agree, the company has hit the mark with the Wizard X220. It is one of the most exhilarating drones to fly for its price. One significant improvement is the use of an X frame design, which combined with 3-bladed props, gives the X220 much more power and maneuverability than its predecessors. One thing the X frame structure does is remove unnecessary materials, thus lowering the weight of the drone, especially at the front. Secondly, it improves weight distribution, which improves the drone’s stability while in the air. 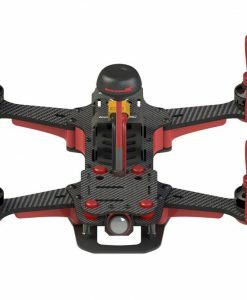 Many new premium racing drones now feature X frame designs. So it’s nice to see the low-cost X220 also take the same path. About the props, some racers might say that the 3-blade props are a huge downer. 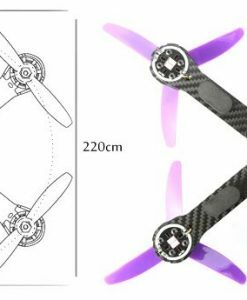 There is a big debate regarding which is better between 3 and 2-blade propellers. The arguments are about which style provides more speed, balance, and power. Dual blade props are quite common, but tri blade props are also getting more popular. The best choice will depend a lot on you and your skills. If you are a good racer, then a well-designed 2-blade drone is going to be just fine. However, many users have noticed that drones with 3-blade propellers tend to have better balance and stability. This is most likely because they can create more thrust, allowing them to turn, stop and lift with more ease. 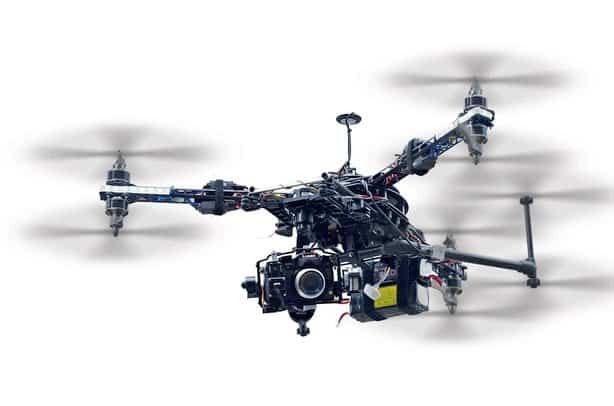 Some users even say their video feed gets less-shaky with a 3-blade prop drone. Whatever the case, don’t get turned off by the number of blades or have unrealistic expectations about what three blades can achieve. Unless you are getting into serious competitive racing (the X220 is not built for such), your experience and skills are going to matter more than the number of blades. And anyway, you can always mod the ARF version of the X220 to fit your specific preferences. A final part of the new design is the inclined motor base (borrowed from previous Eachine models). The inclined shape reduces drag when the drone is flying, which helps boost speed. The Wizard X220 comes with the option of customizations when you choose the ARF model. 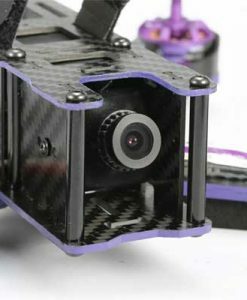 As we mentioned in our racing drones guide, the fastest drones are almost always custom build ones. Ready to fly (RTF) drones are great for beginners and hobbyist racers but may not cut it for serious drone racers. If you are going to compete against other crazily enhanced drones, you also have to go crazy with yours. 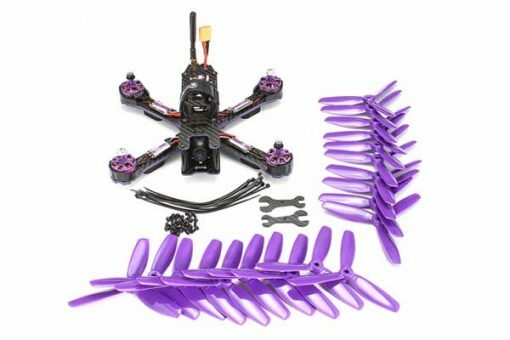 Eachine gives you that chance with the ARF X220. While the RTF comes with everything you need to start flying immediately, the ARF lets you use some of your components. The parts you’ll have to supply and install yourself include a battery, remote control, receiver and charger and anything else you deem necessary. It’s easy to add parts to the X220. A few YouTube videos and drone racing forums and you have your custom build FPV racing drone in no time. Even if you, not an experienced drone racer, don’t be scared to try out the ARF version. It will teach you a lot and help you develop faster. For fresh beginners, the RTF model might be a better buy. 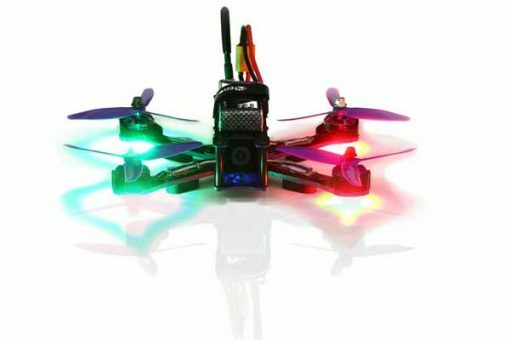 It’s still quite powerful and will help you learn the basics of drone racing before you start modding. 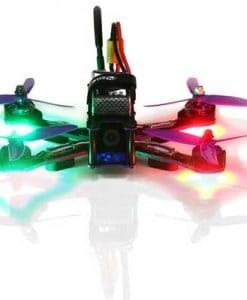 Both the ARF and RTF versions come with four 2205 2300KV brushless motors installed. Two of the motors are CW (clockwise) while the other pair is marked as CCW (counter-clockwise). Note that the CW and CCW indications are not suggestions for which directions your propellers should rotate. The markings simply indicate motor threading. CW motors have a right-hand threading while CCW motors have a left-hand threading. To prevent the nuts and your propellers coming loose during flight, you should pair a CW motor with a counter-clockwise spinning propeller and a CCW motor with a clockwise spinning propeller. Proper installation is primarily necessary for those who plan on buying the ARF model. Away from the threading, the motor itself is quite powerful. The energy efficient brushless motors produce enough thrust to lift the X220 and push it forward with speed easily. Each of the motors has a max thrust of 440g. Combined, that’s over 1600g in thrust. If you are modding your copter, consider upgrading to a 4S battery. It will deliver more power to the motors, allowing you more speed and maneuvers. 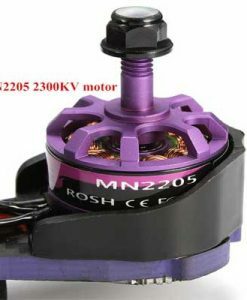 The motors have removable protection to increase durability and protect them from mud and dust. You can remove the protections to reduce weight, but I wouldn’t recommend it. When you crash the drone several times, you’ll be glad for them. And they don’t add much weight anyway. The star of the party is the 700TVL Camera mounted at the front of the frame (available in both models). For an entry level racer, the Wizard X220 has a perfect camera. It has a wide field of vision, allowing you to see the path ahead and confidently make tight maneuvers. It also retains decent clarity in low light. The camera is mounted on an adjustable angle mount, providing you with even more flexibility and a much wider field of vision. 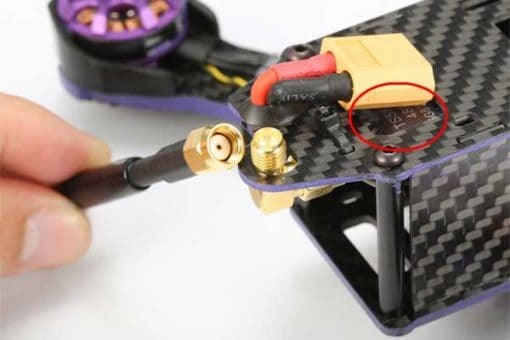 The video transmitter is connected to the antenna which reduces vibrations and helps keep the transmitter safe in case you crush into something. For those who want to record their flight, there is still room to mount an action camera such as a GoPro. But be careful not to weigh down the drone especially at the front as it could affect your speed and stability. Remember the drone does not come with any goggles, so you have to find your own. Our full guide has some good tips on how to buy the right FPV goggles plus a few great recommendations. The Eachine Wizard X220 uses a 2.4G FS-i6 6-channel remote controller. It feels light in your hands (it weighs just 392g), an important feature when you are in competitive racing. The controller is easy to program and connect to your drone. It can even be connected to multiple drones, meaning you don’t have to buy several different controllers if you have multiple racing drones. It operates at a 2.4GHz frequency range, has six channels and a multi-direction antenna. All this is aimed at improving range and minimizing latency. I especially love its Unique ID feature which comes in handy when you bind it to several aircraft. When you pair it with your copter’s receiver, it saves the unique ID from that receiver. During the flight, it will only accept data from that ID, which prevents interference from other signals nearby. The controller has been designed to use minimal power. It will not hog your battery. Remember that the ARF version comes without the receiver or remote control. There are lots of choices out there that are compatible with the X220. Even if you buy the RTF one, you can still replace the base station and bind the new one to your receiver. 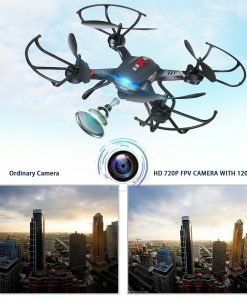 The Eachine Wizard X220 is a fairly cheap racing drone, so I did not expect features like a recording camera, telemetry or GPS navigation. But you can mount your camera and do a few other upgrades to add what’s missing. As for navigation, Eachine came up with a basic but effective solution: indicator lights. Because of the proportional shape of the X220, it can be difficult to tell the front from the back or the side. Black and red LEDs take the place of GPS navigation. There are four LED lights, one for each motor. They are positioned below the motors. The green lights are on the right side and the red ones on the left though some customers have their drones with the green lights at the front and red ones at the back. The essential thing is to understand your own drone’s orientation. The indicator LEDs are useful when you are not using FPV goggles and are instead flying the drone in your line of sight. Because there is no video feed to orient your flying direction, the LEDs can help you. They are bright enough that you can see them from far away even in bright sunlight. Another thing I love about the X220 is how it sticks to standard design standards. This makes it easy for anyone to switch out parts and customize their aircraft. If you buy the ARF drone, you can change a lot of the components including the motors, battery, props, receiver, and antenna. 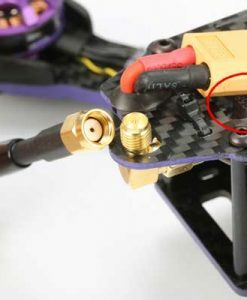 Eachine has several proprietary parts that are compatible with the X220. But you can also use other third-party components. Compatibility issues are minimal. 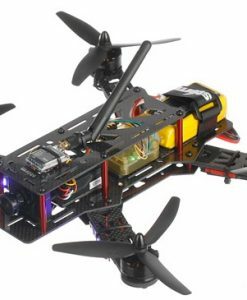 The Wizard X220 may seem basic and cheap at first, but it is more of a platform that you can build on to create a powerful racing drone. If you have some experience, you can even tweak the software and programming to achieve exactly what you want. Races and local events are great ways to discover new mods and get ideas from other enthusiasts. If this feels a bit too much, the ready to fly model is also great especially for those who are looking for an exciting way to enter the world of drone racing.